Our family moved to Paso Robles in 1884 from Geneseo, Illinois, and settled what is now known as the Geneseo Distrcit sub-appelation of the Paso Robles Wine Region. Our estate family vinyeards were established in 1982 by Howie Steinbeck, and now is managed with grandson Ryan Newkirk. In 2006, Howie's daughter Cindy Steinbeck established the Steinbeck wine label with winemaker Steve Glossner, and repurposed the family's 1921 built blacksmith shop as the tasting room, open daily for customers from 11am-4:45pm. Howie Steinbeck pioneered modern grape growing in the Geneseo District of Paso Robles, and since 1982 the vinyeards have grown to 525 acres. They provide premium wine grapes for several wineries in Paso Robles, and we handpick just 1% of our fruit to craft between 1,200 and 1,400 cases a year. Call 805-238-1854 for information or to schedule a tour. heart of the grape growers. 2014 Cabernet Sauvignon, 2014 Petite Sirah, 2015 Viognier and 2015 Zinfandel are the varietals we’ve chosen to craft into 1,250 cases of premium wine. 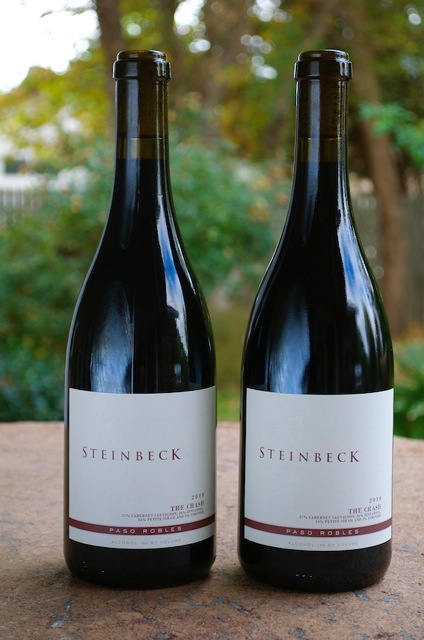 We blend these varietals into THE CRASH, "known as Steinbeck in a glass." 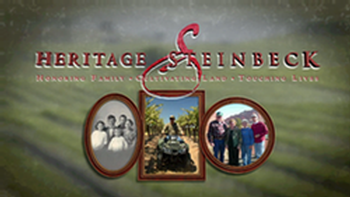 Click on image to view Heritage Steinbeck Documentary filmed in 2014. This 32 minute film showcases our generational history and tells story of the 1956 B-26 Crash on our historic property. The Steinbeck Tasting Room - Rustic Elegance! Rusty tin siding gives way to an elegant museum-like tasting room. Walk through our family's past in our little museum and enjoy the taste of our future at Steinbeck Vineyards and Winery (and a few stories)! Steve has an amazing history in Paso Robles and we are thrilled he works with us to help us continue our legacy. His winemaking style brings the varietal characteristics through with an elegant finish. PET POLICY: Your furry friend is welcome at Steinbeck - on leash please.